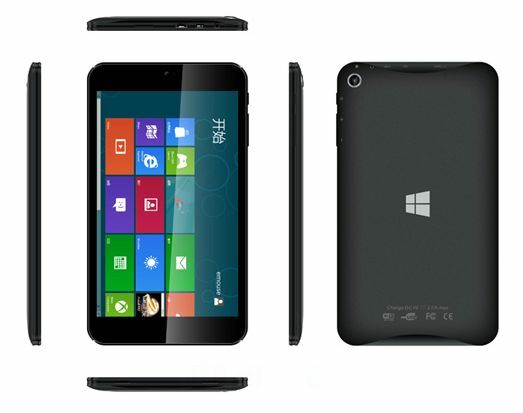 Toshiba isn't the only tablet maker working on a 7" Windows 8 device. A Chinese OEM by the name of Emdoor also has one on the works. In addition to offering dual-boot Win8/Android tablets and the 8" EM-i8080, Emdoor is also now showing off a 7" tablet that runs Windows 8.1. The Emdoor Miso looks a lot like yesterday's Toshiba Encore tablet, only better. The Miso runs Windows 8.1 on a quad-core 1.3GHz Intel Atom Z3735G CPU with 1GB RAM, 16GB internal storage, and a microSD card slot. It sports two 2MP cameras, Bluetooth, Wifi, and has a single speaker on the back. It also an HDMI port. The screen resolution is a decent 1280 x 800, which is a slight improvement on the Encore Windows 8 tablet that Toshiba revealed yesterday. Battery life is estimated to be in the range of 6 hours. Emdoor hasn't released any details on price (that is up to their importer partner) but they do plan to begin mass production in August. I'm not expecting this tablet to be extremely cheap. While it does have an Atom CPU, a brief Google search reminds me that the Z3735G is a 64 bit chip that has not been used in any Android tablets yet - or very many Windows 8 tablets, for that matter. At this point it is too early to guesstimate the price, but I would place the upper limit at $149. That's the expected price for the Encore 7 tablet, and given that the Miso has better specs I hesitate to price it below Toshiba's tablet. 7″ Windows is just to small. My 8 is just barely passable on the desktop side of it. Toshiba used to sell a 5″ Libretto clamshell that survived several years and iterations. Never underestimate road warriors’ need appetite for compact PCs.